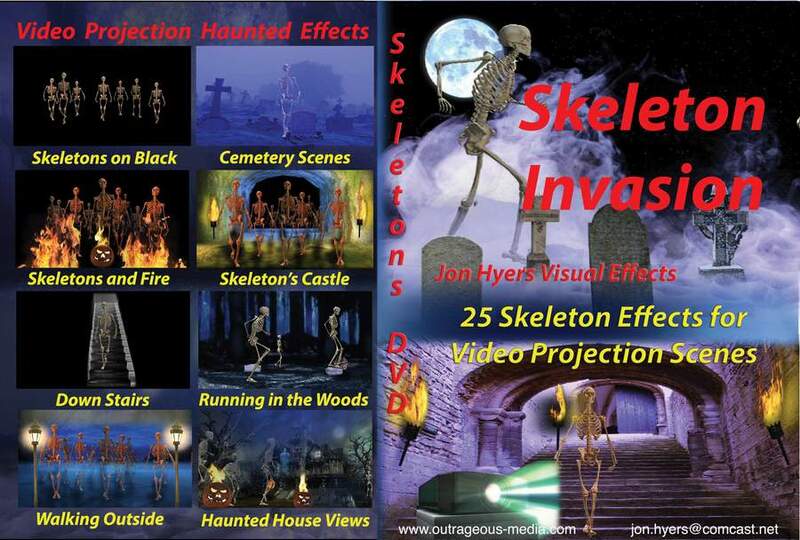 Ready-to-Use Special Effects on DVD for Video Projection Illusions to use for Haunted House, and Halloween Home decorating, Skeleton Invasion has more than 25 chapters with a wide variety of Skeleton scenes. They walk alone or in groups, and come with a variety of backgrounds. The white background lets you project directly onto the side of a house or onto a light colored wall, and the white light around the skeletons illuminates your wall without additional lighting. The black background lets you project just the skeletons, perfect for projecting onto scrim stretched across the yard or in your living room. Skeletons walk down various staircases, in the woods, the cemetery, in front of a haunted house, and inside castle halls! The highlight effects in this DVD contain some chapters with a skeleton breaking out a window and walking out of the room.